Hey guys, our peek in the week is a little later in the day then usual but only because we have been pretty busy. Of course we had the Thanksgiving festivities on Thursday, but Friday, Saturday, and Sunday we spent at the Allenberry resort for the Murder Mystery weekend. The theme was "A Diva to Die For" and it was about a billionaire's daughter who is about to celebrate her 21st birthday but over the weekend her parents end up dead. The guests are encouraged to take notes to solve the murder but as usual, we got it wrong! 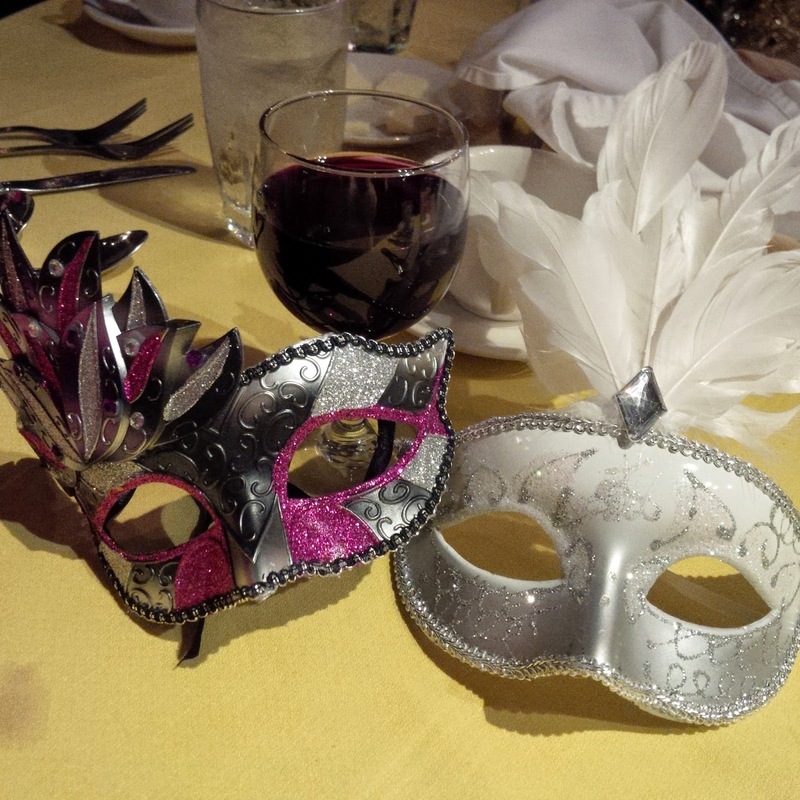 Each night was a different theme, but the formal night was Saturday and the theme was a masquerade ball. At one point in the weekend we got to go for our first run on the Appalachain Trail. Because of the wet conditions this past week, it made for less then ideal running conditions on the trail, ( it was pretty messy and we had to watch our step). But other then that, we'd like to run it again in the Summer. Ok, in honor of tomorrow being Cyber Monday, we have a giveaway coming up! You are going to be logging on to your computer anyway, right? So stop by here for a very SWEET giveaway! Hello Friends and Happy Friday, Happy Black Friday that is! We hope everyone had a fantastic turkey day. 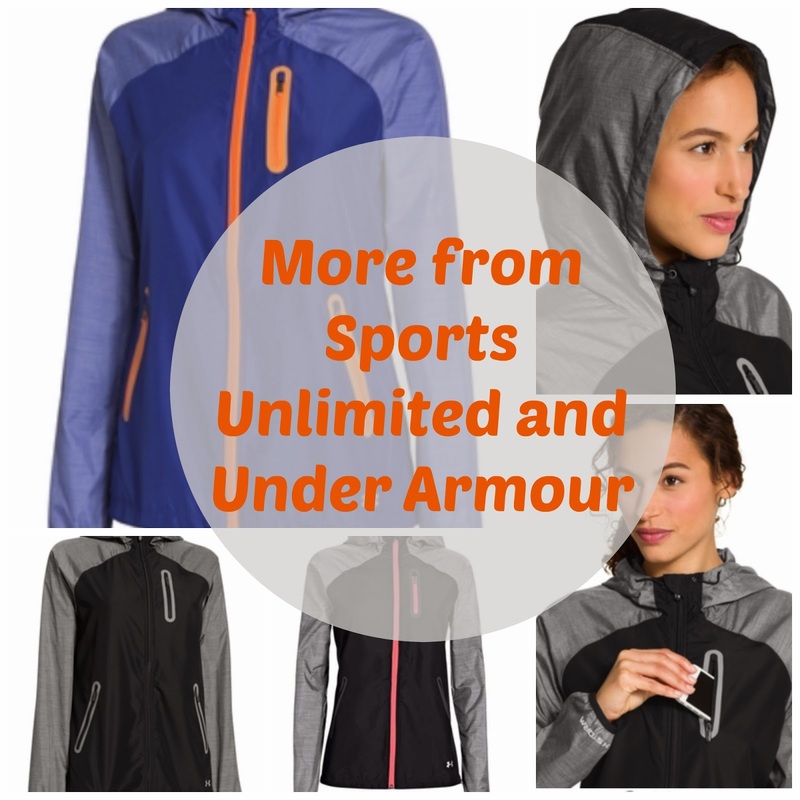 Since we often share with you good deals on Fitness apparel and fun stuff you would think that we would have posted some of those deals for you here today. But the truth is, we aren't shoppers! We didn't get up at 3 am and we have no idea what sales are out there but if we just happen to come across something super fabulous, we'll be sure to let you know. Instead, we are headed to another Murder Mystery Weekend. 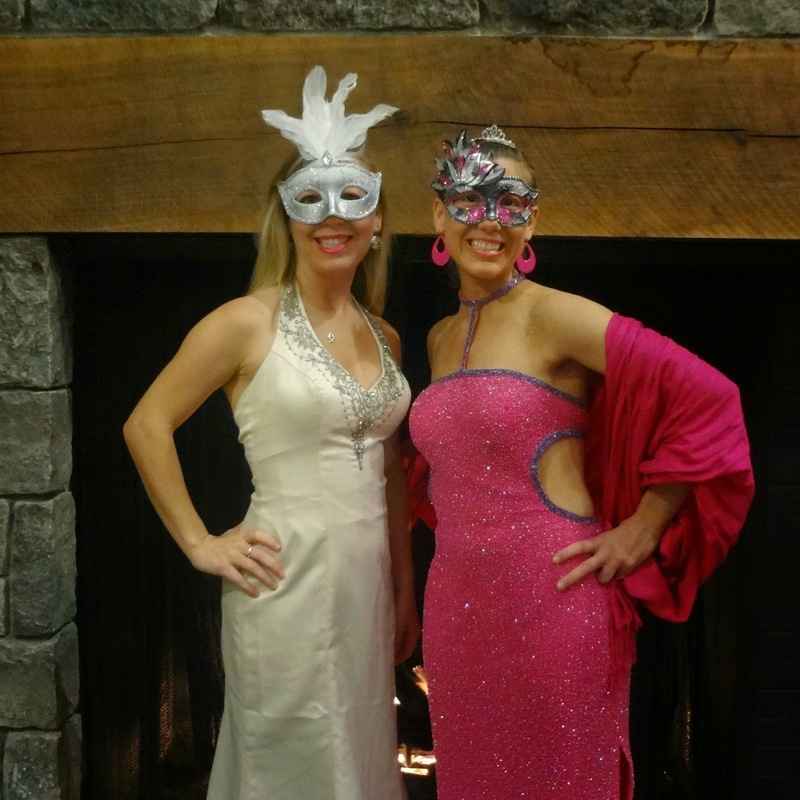 We love our Murder Mystery Weekends! In fact, you may have remembered when we went to one back in March where the theme was Back in Time. The theme this time around is A Diva to Die For, ( It's a birthday party theme). 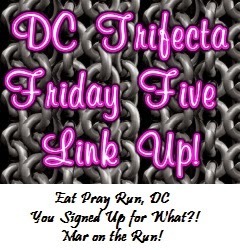 Since it is Friday, we are still linking up with the gals for the Friday 5 and the theme is gratitude. 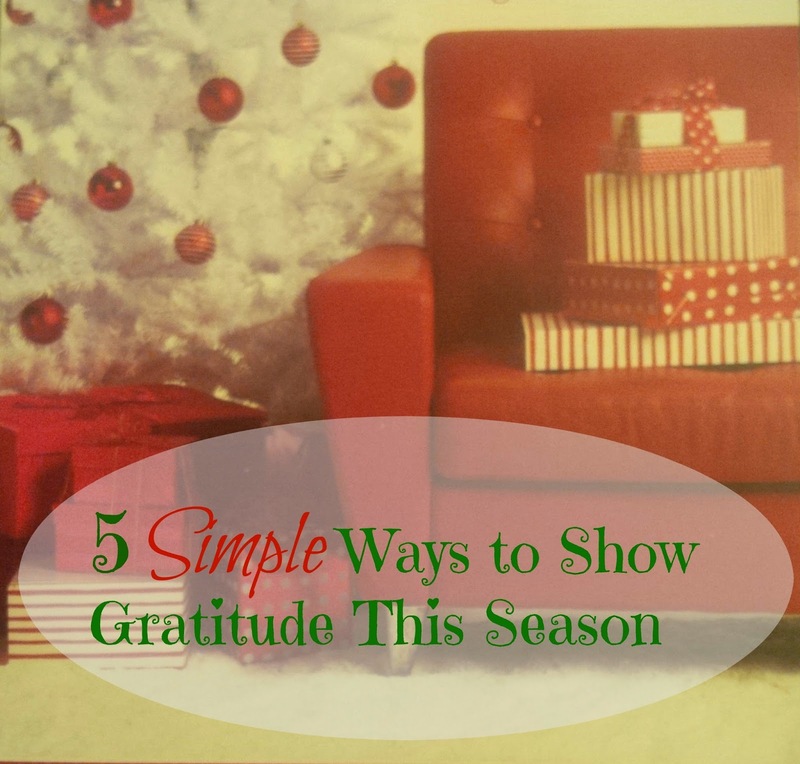 We wanted to show 5 simple ways you can express gratitude this holiday season. 1. Volunteer- Volunteering can be fun and is a wonderful way to show gratitude to your community. My mom and I have volunteered at a local senior center wrapping holiday gifts. We actually had a lot of fun and hope to do it again this season. 2. Make Food- I think everyone loves food gifts. Baking a little something for a neighbor is a great way to show you are thankful for them. 3. Make a phone call- We thought of our grandparents when we came up with this one. It's so easy to just text people when we want to chat, but our grandparents don't text ( our Pappy tries), and I know getting a call from us really makes their day. Think of someone in your life who could use a phone call. 4. Write a hand written note or card- Again, technology has really taken over the way we communicate yet nothing can replace the feeling of getting a card in the mail. Speaking of cards, today officially starts the Holiday Card Swap! 5. Last but not least, Remember to thank those who work on the holidays. Whether it's a waiter at a restaurant, a cashier at a store, or the pizza delivery guy (or gal). So many people have to work during the holidays and it would be nice to appreciate them. Remember to be polite and to always say Thank You. I'm sure they would much rather be home with their families too. What ways will you be showing gratitude this season? Did you shop today? If so, what did you buy? Like most travelers we fly into the Orlando International airport and take Disney's Magical Express to the Disney World Resort. When we get in line for the Magical Express, we can already feel the Disney Magic! Of course relying solely on Disney transportation can be a little limiting if you ever want to venture of property. We don't go off property much, so we don't usually mind. This past trip we had the opportunity to get off property and explore a little bit of the Lake Buena Vista area. 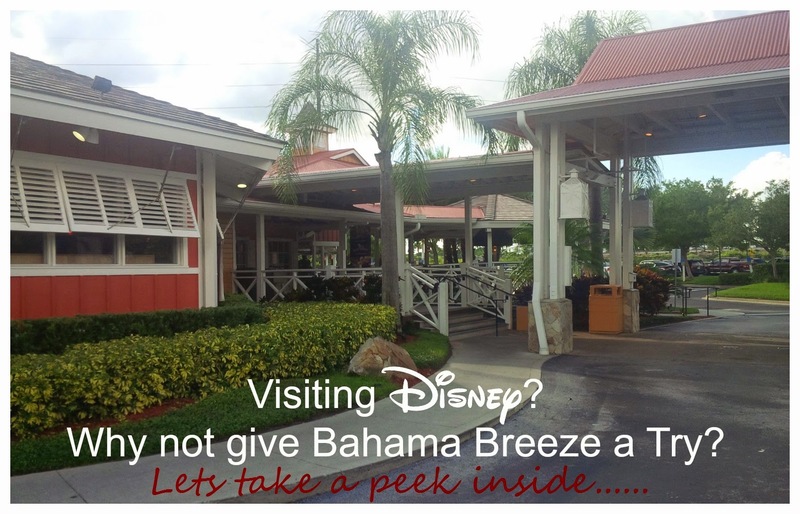 One place that we stopped was Bahama Breeze on Vineland Avenue ( this is considered the Lake Buena Vista Location. There is another location on International Drive). I am so glad that we stopped here for lunch. This was easily one of our best meals throughout the trip. We walked right in and there was no wait if we wanted to sit outside on the lanai. This was perfect since it was an extremely gorgeous day out. 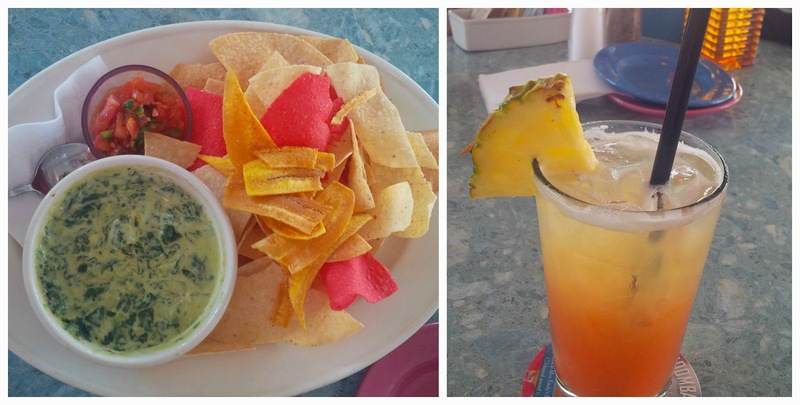 For starters, the spinach dip and chips. I also had this refreshing beverage but I forget what it was called. I know it was a "Sunset" something or other but couldn't find it on the menu. 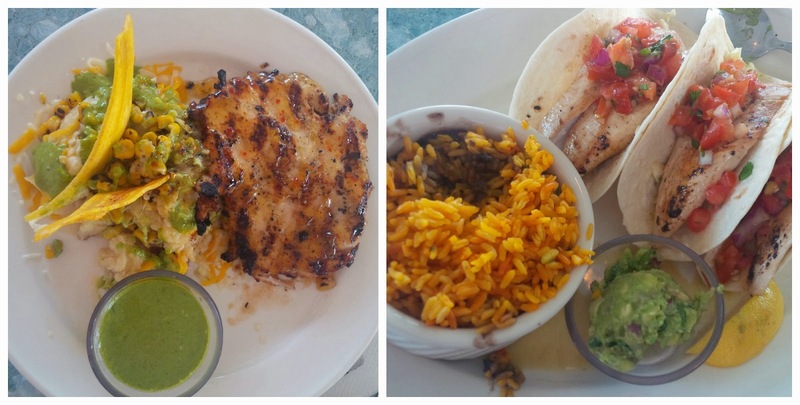 I had the Grilled Chicken with Cilantro Crema ( that is not a typo, it is crema, not cream) . It came with mashed potatoes and roasted corn topped with a blend of three melted cheeses drizzled with cilantro crema sauce! This was amazing! Scott had the Key West Fish Tacos which he said was fantastic as well. For dessert the waiter suggested this cake ( I think it was some sort of rum cake). 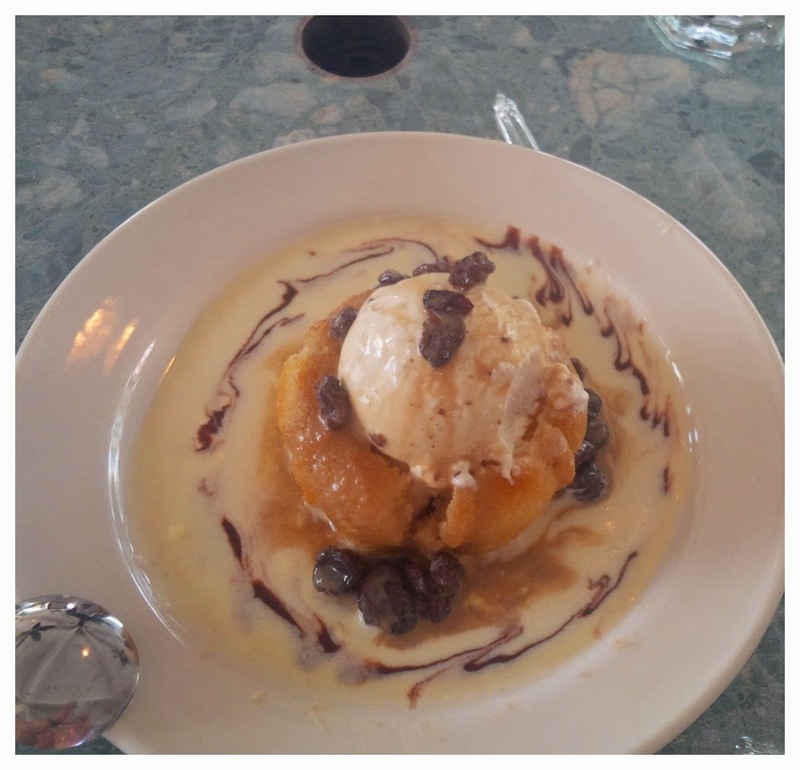 I don't usually order dessert but since we were on vacation I thought "Why not". 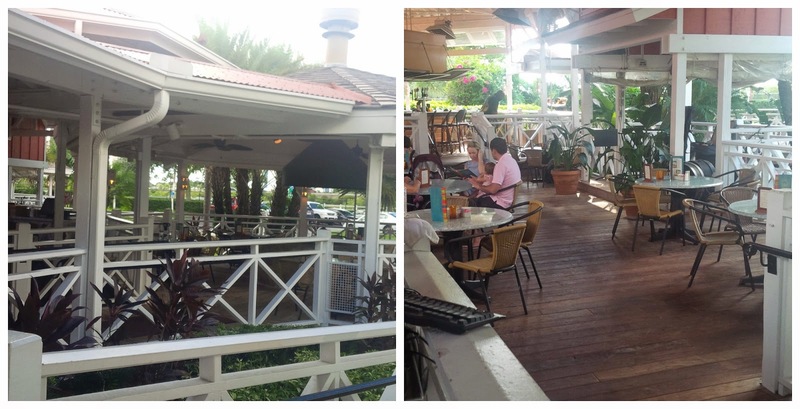 Have you ever been to Bahama Breeze? If so, I hope you had a pleasant experience too! 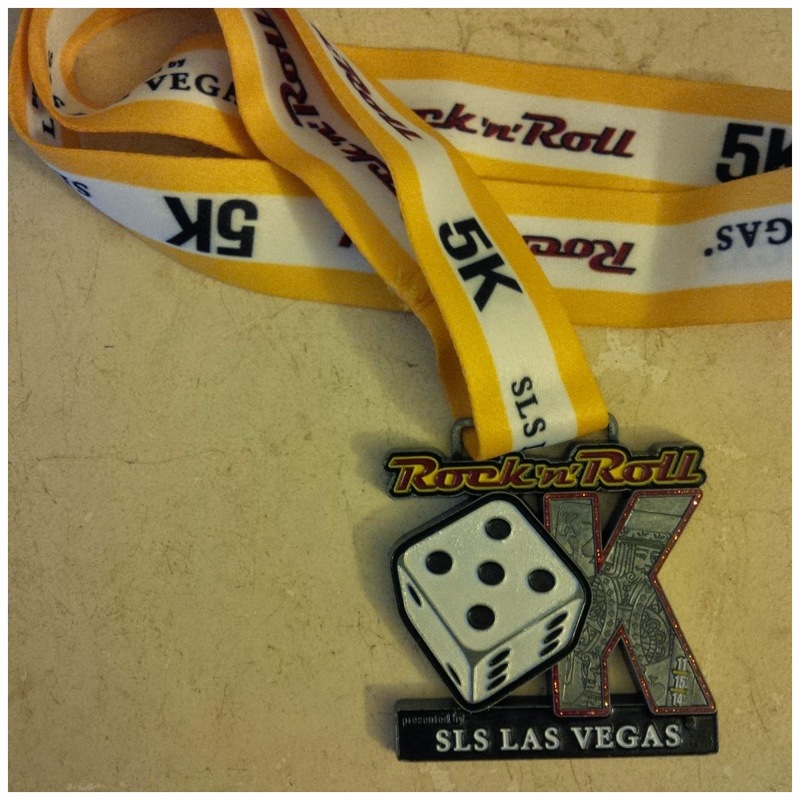 Sunday was the Rock n Roll Las Vegas Marathon and Half Marathon. We planned to just relax at the resort this day. We got a late start so we ended up having a late breakfast and therefore didn't feel like eating a lunch before we left our resort at around 2:30pm. We each ended up eating our banana from the 5K the night before as we walked to the monorail. We were worried that we hadn't fueled properly that day before the race but we crossed our fingers and hoped for the best. Unlike the 5k the night before, we were not able to walk to this race start from our hotel. 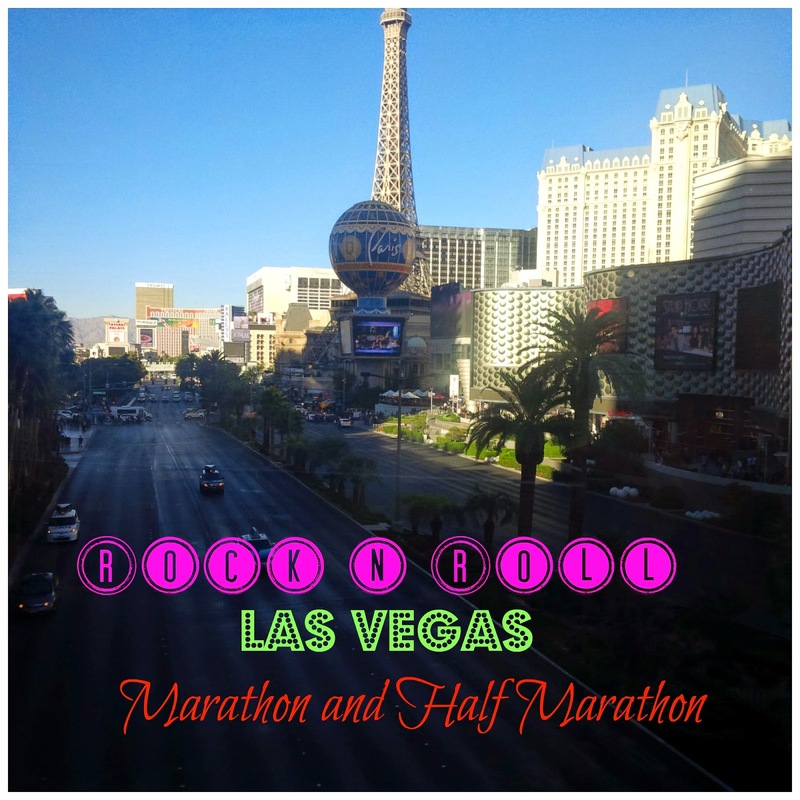 The marathon and half marathon both started at the South end of the Las Vegas Strip. We had a quick walk to the monorail ( which unlike at Disney, you have to purchase a ticket to ride. We ended up purchasing a three day pass but didn't end up using it all the other days because we found it was more convenient to just walk to where we needed to be). As we were on the monorail, I remembered that I forgot to put the "marathon cream" on the back of my knees like I had wanted to. I had been having some pain in that area and my sister bought this cream at the expo that she said worked for her. We rode the monorail all the way to the end ( which was the MGM resort), got off and still had to walk about 3 miles to the start line. There were 48 corrals, and it filled up 2 roads! The marathon and half marathon started in the same place and were inter mixed in the corrals. We placed ourselves in the correct corrals although there was no one monitoring it. This was evident when I was at mile 2 and I was passing folks who had bib numbers in the 30's and 40's! It was quite chilly that evening ( there was actually a freeze warning in effect for that night). I ended up wearing a long sleeve shirt over my tank top and my gloves. My mom wore a long sleeve as well and Lacey wore a short sleeve with her arm sleeves. The first corral started at 4:30 pm and a few minutes later our corrals started. I can't believe how dark it got just in the few minutes that we waited to start. 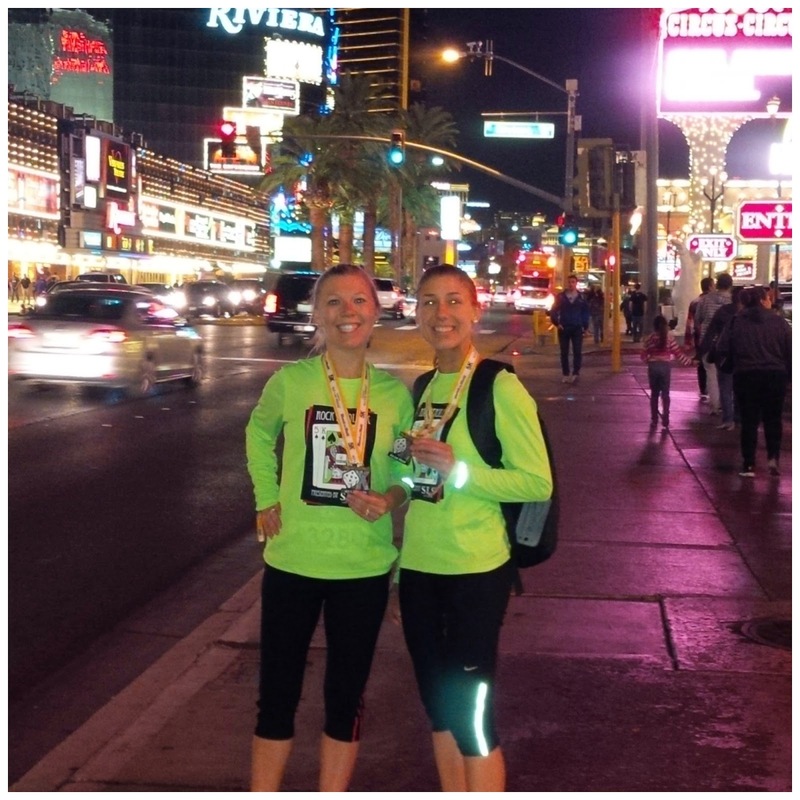 The first mile was actually behind the Las Vegas Strip and then mile 2 was when we turned on to the strip. We passed the "Welcome to Fabulous Las Vegas" sign, which we both neglected to take a picture of. Running down the strip and seeing all the lights and especially the lights, tall buildings, and Statue of Liberty from the New York, New York, resort gave me a feeling as though I was really running through New York City! I figured after this race, I don't have a need to run a NYC race now! From what I can remember, we were running on the strip till about mile 6. We passed the famous "Gold and Silver Pawn Shop" from the show Pawn Stars. I don't know who it was but I actually saw a person sitting inside. You would think they would be out cheering for the runners! We passed multiple wedding chapels ( I wish I would have started counting them). Although I didn't witness any runners getting married, I did witness a runner stopping in front of the Elvis Chapel to propose to another runner. 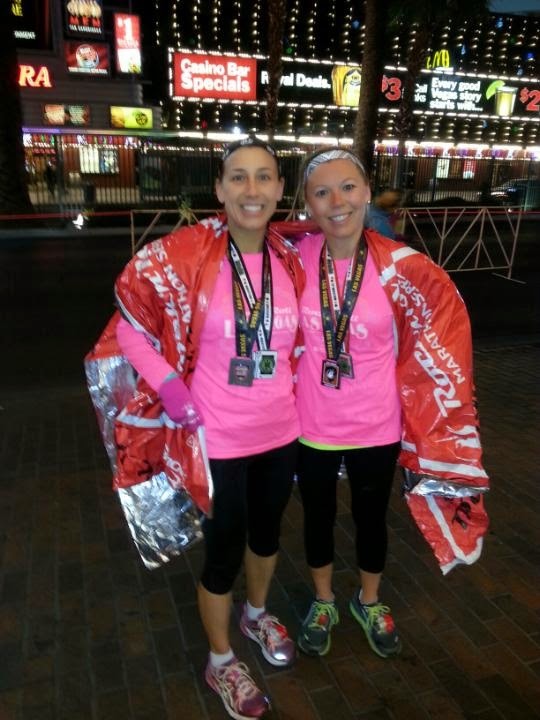 Mile 7 was in a residential area and then mile 8 was in front of Freemont street. That is where they were giving out GU and where the split off was. Half marathoners went left and marathoners went right. 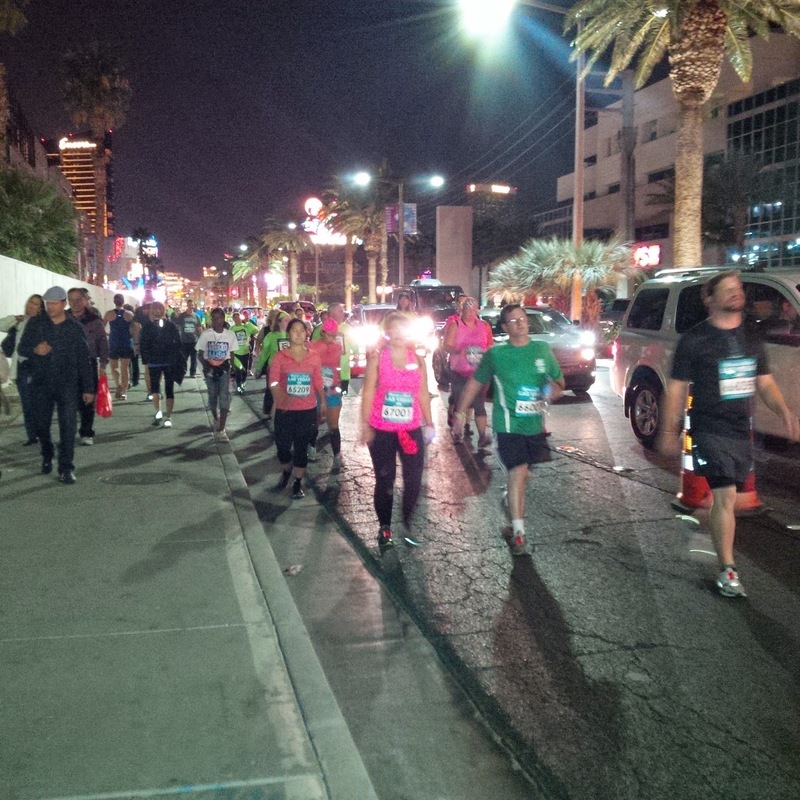 After the left hand turn, the half marathoners were back on the strip again until we reached the finish line. I ended up crossing the finish line at 2:20. I was actually pleased with this time seeing as this was my time when I first ran 13.1 miles in 2013. My goal for that year was to try to improve that time but as you know, I ended up being injured for 7 months so my previous half marathons were not ran for time. I may not have improved, but at least I'm back where I started! 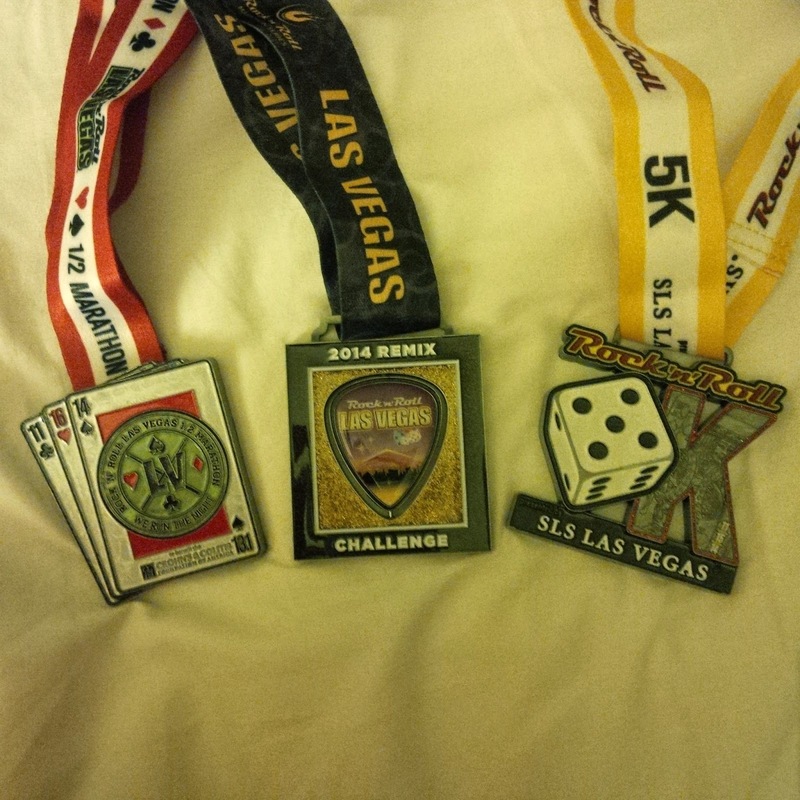 The medal on the left is from the half marathon ( the full marathon was the same design but outlines in black instead of red and slightly bigger) the middle one is the remix challenge medal for doing both the 5K and the half/full ( it's a spinner medal and I bet we walked about another mile just to find those) and the one on the right is the 5K medal we earned the day before. Now on to the FULL Marathon....When I first signed up for this race I was really excited. 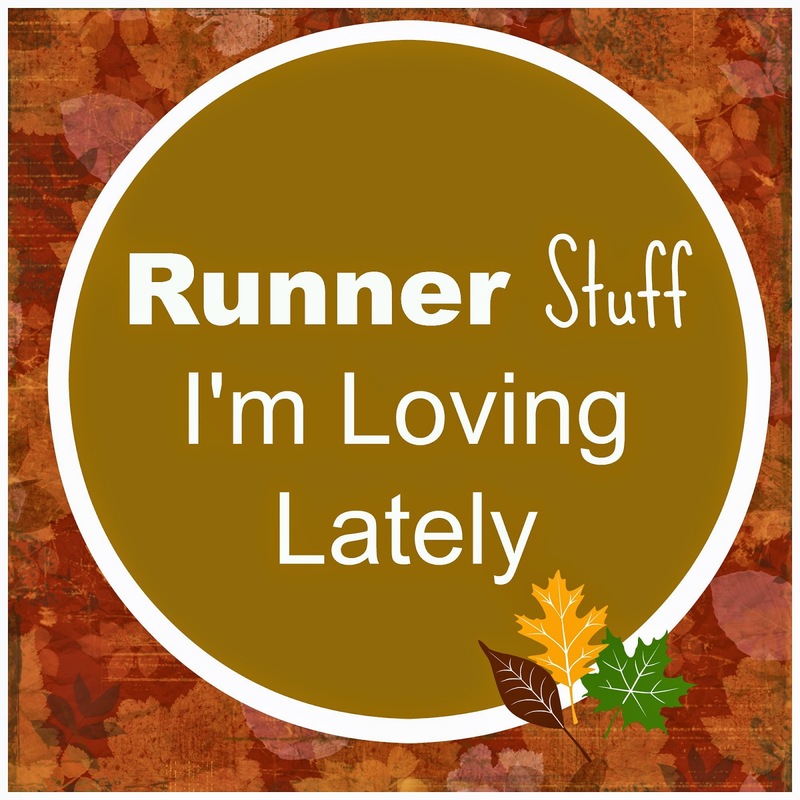 I had never ran a fall marathon and was excited to see how my training in the summer would reflect my race in the fall. With cooler temps and a flat course, I was hopeful for a PR. But ever since MCM I have been having IT band issues and haven't gotten any long runs in. When I was at the Expo in Vegas I purchased this marathon cream that was suppose to help with soreness on the area. I don't if it was a quick fix or if it was just in my head but I thought it really helped with the pain. It was almost like a Biofreeze that smelled good. After I put it on my leg I was freezing. It almost felt like a numbing cream. No wonder why I wasn't in any pain after I put it on! I used it that night several times as well as the next morning. I wish I would've put it on right before I left to the start but time got away from me and I was busy doing other things. I was in corral 8 and when I started it was still daylight but not for long. I told myself I was going to be conservative since my leg had been bothering me. I kept thinking to myself I should've ran the half instead. They had the fun part up and back on the strip. While we have to venture out into the desert. 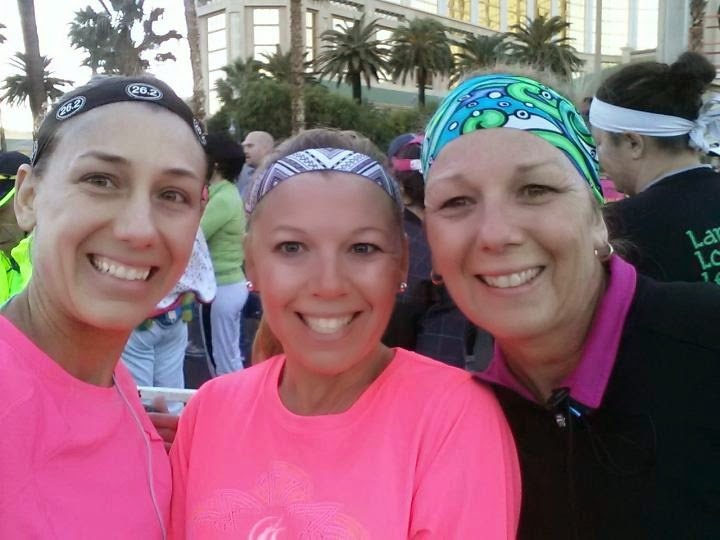 After we branched off at mile 9 we ran under the Freemont street dome. That was the most fun of the Full Marathon. There were many spectators along this stretch. After that, it just got really quite for a long time. There were a few bands along the way and a lighted arch you ran through, but nothing too exciting. During this time I became very cold and it was a bit windy. I kept thinking I was going to warm up while I was running but it was the complete opposite. I would sweat and then the sweat just made me cold. I was so glad to have chosen the short sleeve and arm sleeves opposed to the tank top I almost wore. 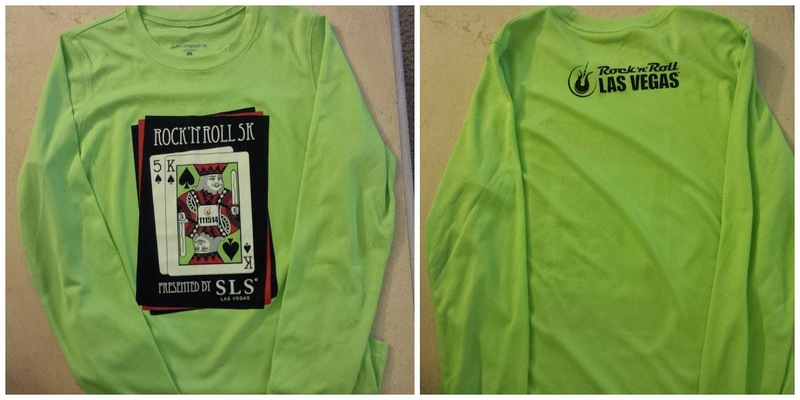 I probably could've went with a long sleeve since I never rolled my arm sleeves down once. After hitting the half way mark I knew I was going slower than normal and knew I would have to pick it up a little the second half to make the time I wanted to. My leg was still bothering me a bit but I told myself I was going to feel it going slow or fast so lets pick it up. They say there comes a time in a marathon that it becomes mental over physical and I was hoping this was the time. The only other fun part was running back through the Freemont dome at mile 21. Shortly after that we were back on the strip for the home stretch. I kept thinking to myself regardless of my time I am going to finish strong and always know it could've been a lot worse. I don't regret anything that I have done during this marathon, except for not wearing a long sleeve shirt and gloves instead. After a cold but strong finish for each of us. 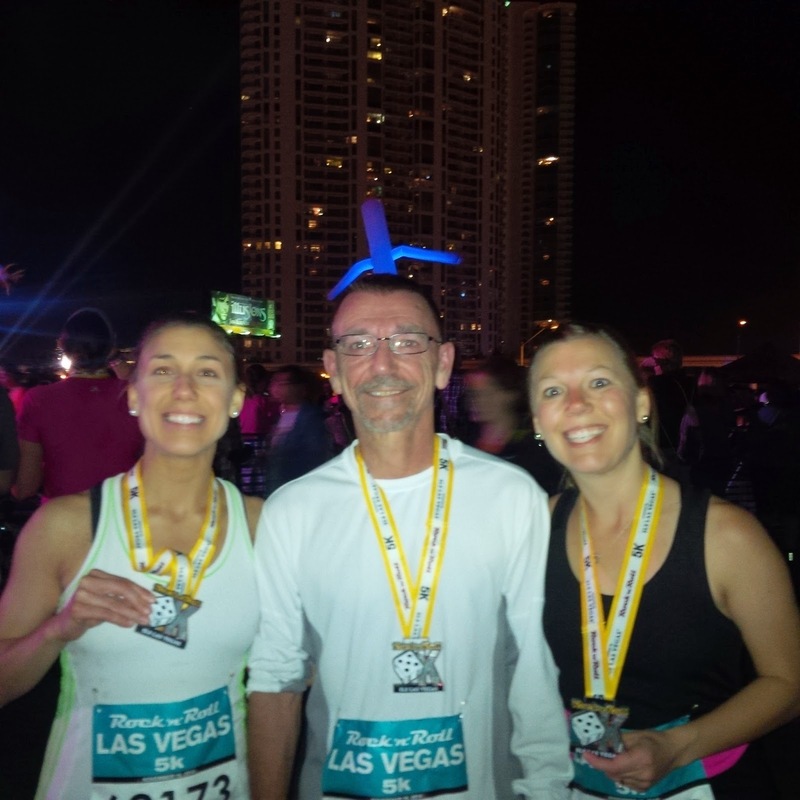 Here is our Recap from the Las Vegas 5K if you are interested in reading that. Have you ever run a race that you didn't quite know how to dress for? If you are a friend of ours on Social Media ( Through our Facebook page, Twitter account or through Blogging) AND you are running any of the races during the Walt Disney World Marathon weekend, we invite you to a Meet Up. 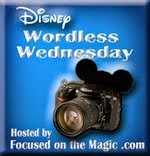 We have been in discussion with a few other bloggers and have decided that Saturday January 10th would be a good time. This way we can celebrate those who had completed the half marathon and we can pump up those that will be running the full marathon the next day. Besides, we didn't know too many people who planned to go to the parks on Saturday afternoon ( due to the marathon being the next day). So this time frame seemed perfect. 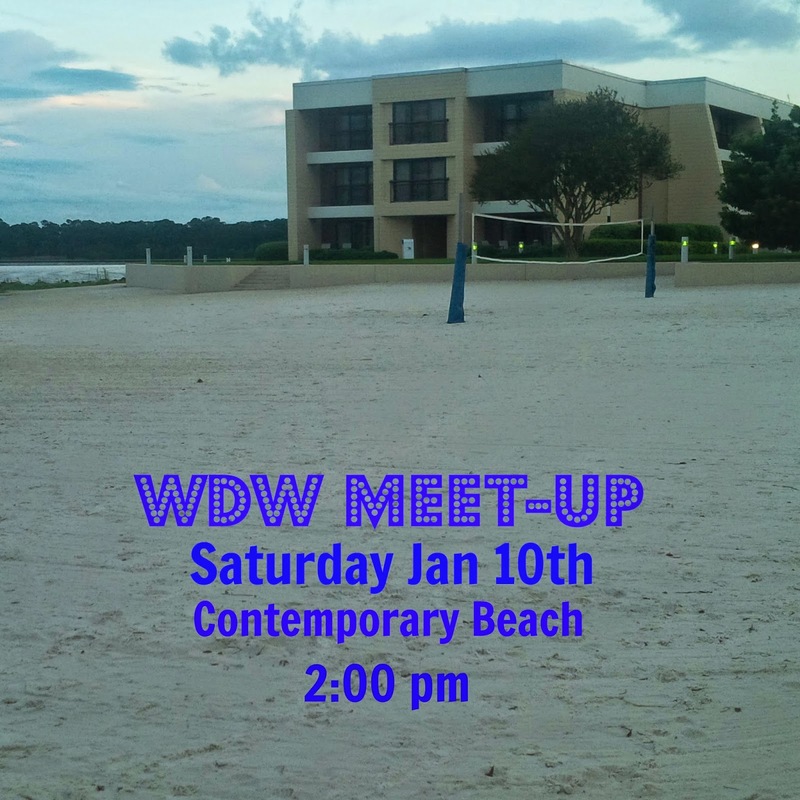 Meet on the beach behind the Contemporary Resort. Depending on how many people we have, we may be able to use some of the contemporary beach chairs but you might want to bring a beach towel too just in case. We do plan to play some games. We do have some vendors who have been gracious enough to donate some prizes for this event. I won't give too much detail about it, but there are some GOOD prizes! So grab your favorite beverage and head over to the Contemporary Resort on Jan 10th! We ( and our vendors) would like to have a count of how many people will be attending so if you plan to come can you please either let us know in the comments or leave us a message on our Facebook page. Thanks! There are always certain flavors that you associated with the holidays, right? At Thanksgiving it's pumpkin, and then around Christmas time it might be peppermint, candy cane,or gingerbread. We love when special "limited edition" flavored stuff comes out while it lasts. 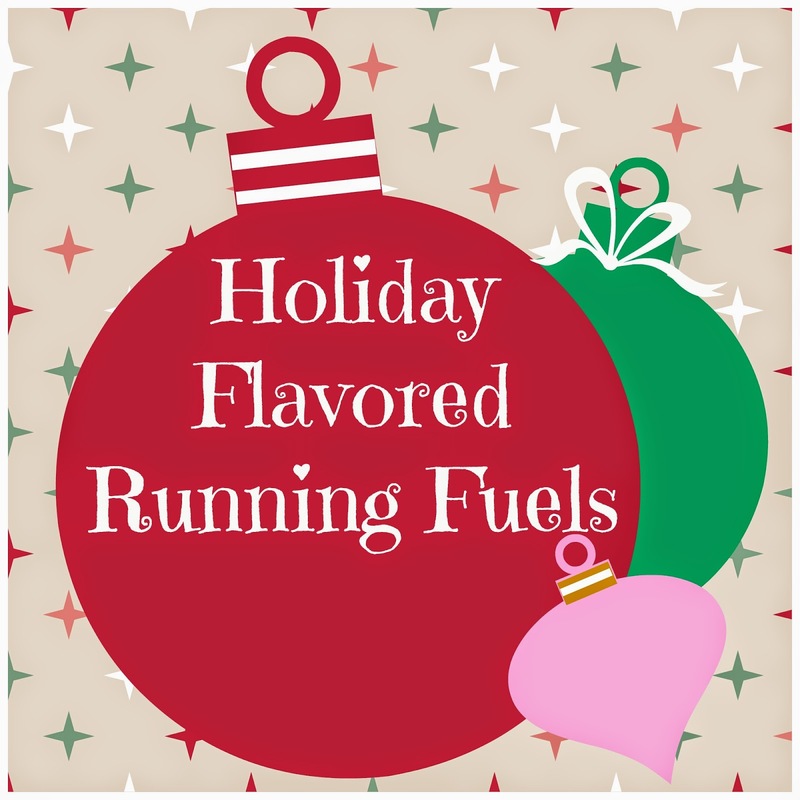 We really get excited when we find Holiday flavored running fuels. Here are a few you might want to pick up this holiday season. 1. Clif Bar- We love Clif Bars. This season's holiday flavors are Spiced Pumpkin Pie, Frosted Gingerbread, and Pecan Pie. I am sad to see that Cranberry Orange Nut Bread will not be returning to the holiday line up this year. 2. Honey Stinger Waffles- You know we love Honey Stingers too! Be sure to pick up a Gingersnap Waffle. It goes great with a hot chocolate or a hot chai tea! 4. GU Energy Gels- Although not exactly listed as holiday flavors, The Salted Caramel and Caramel Macchiato will make you think of the holidays when you are on your run! 5. Lara Bar- If you are a fan of Lara Bars, they have you covered with holiday flavors. The Lara bar line up includes, Snickerdoodle, Gingerbread, Pumpkin Pie and a variety of other pie flavors as well. 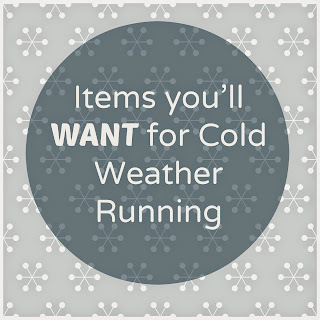 What holiday flavored running fuel have you had lately? 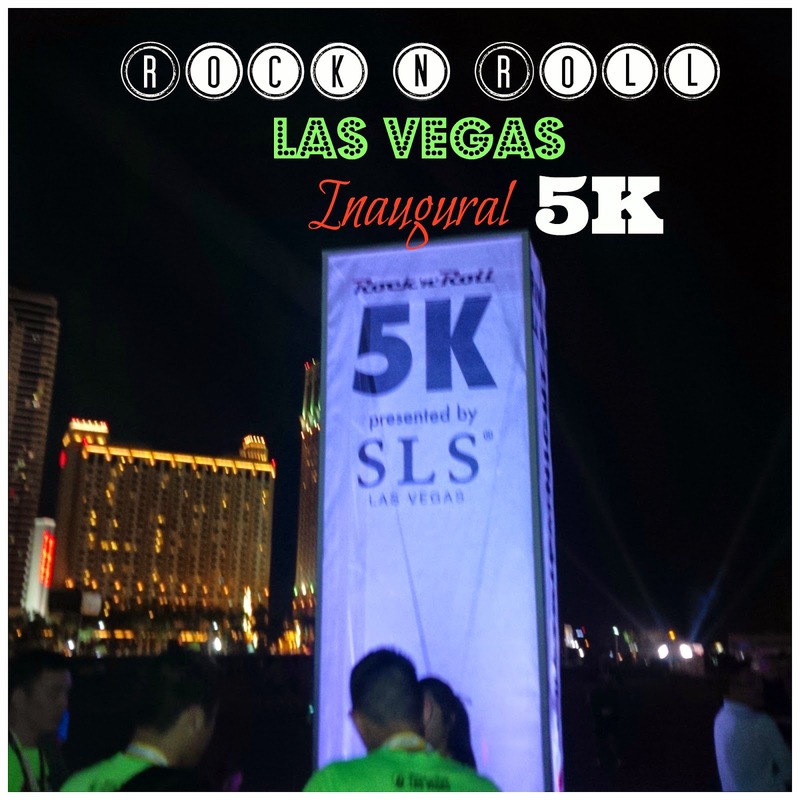 Thank you for all your comments on our Rock n Roll Las Vegas 5K post. 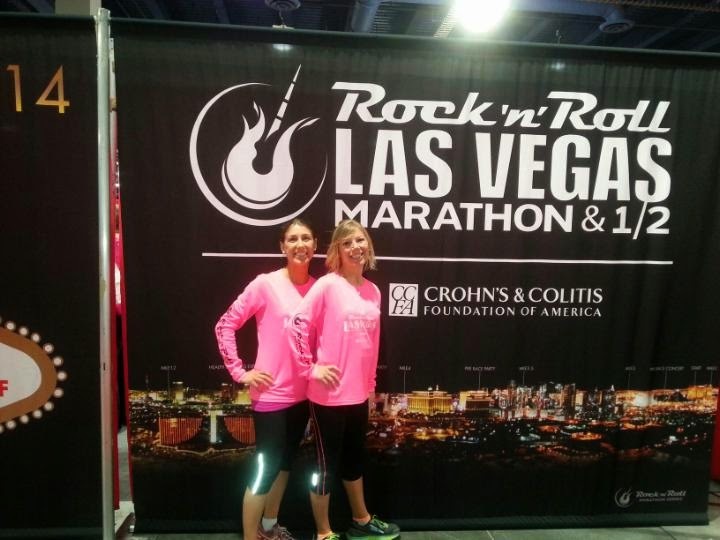 We will continue with the Las Vegas Marathon and Half Marathon next week. On one of the evenings that we were visiting Epcot during the Food and Wine Festival, we decided that we wanted a sit down meal instead of grabbing some food from one of the kiosks. Nine Dragons restaurant in the China Pavilion wasn't even on my radar of a place I wanted to visit but Scott suggested it and I thought "Why not?". I had ever eaten here before so I was up for something new. Surprisingly there was no wait, so we were able to walk right in and be seated. We were seated right by the window, which I loved. I hate eating in restaurants that are dark and have no natural light coming in. I also liked that we could "people watch" all the folks strolling through Epcot. Whatever they were selling in the China kiosk over there must have been a big hit because we watched tons of people order food from there. At first, I wasn't overly impressed with the Nine Dragons' menu, but when the food came out I was pleasantly surprised. 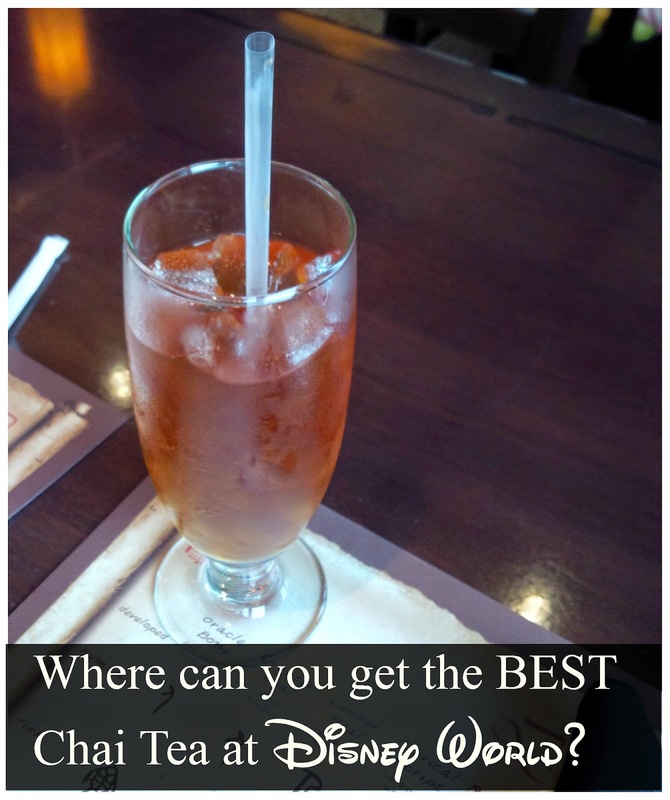 I am a huge fan of Chai tea but have never had it as an "iced" tea. This my friends was FABULOUS. I would come back to Nine Dragons again just to have a Chai Tea! 1. The Cucumber salad ( There were a few more pieces on the plate before I snapped the picture, not many, but a few). This had kind of a sour taste to it and I would not order this again. Scott liked it though. 3. I thought this was the honey Sesame Chicken but as I looked back through other pictures, our chicken did not have the sesame seeds on it. Scott said he thought it was Sweet and Sour Chicken but as I looked back through the menu, there was no Sweet and Sour chicken on it. It was definitely sweet tasting and not sour so I definitely think it was the Honey chicken without the Sesame seeds on it. Regardless of what it was, it was very tasty and I would not hesitate to get it again. There wasn't much on the dessert menu but that was okay, I hadn't planned on getting dessert anyway. 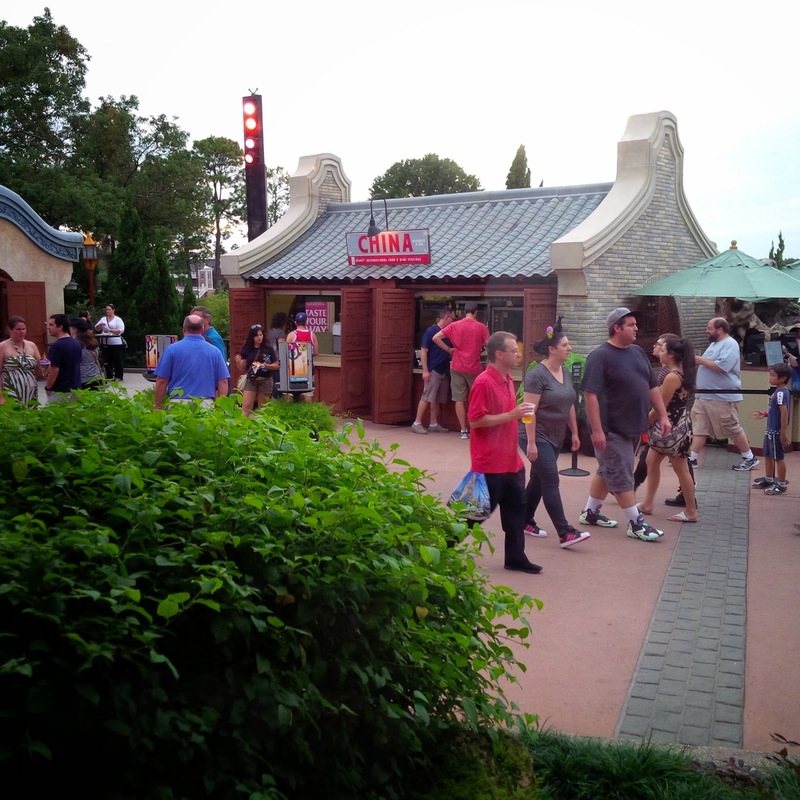 I was hoping to find something from one of the Food and Wine kiosks as we continued our stroll through Epoct. 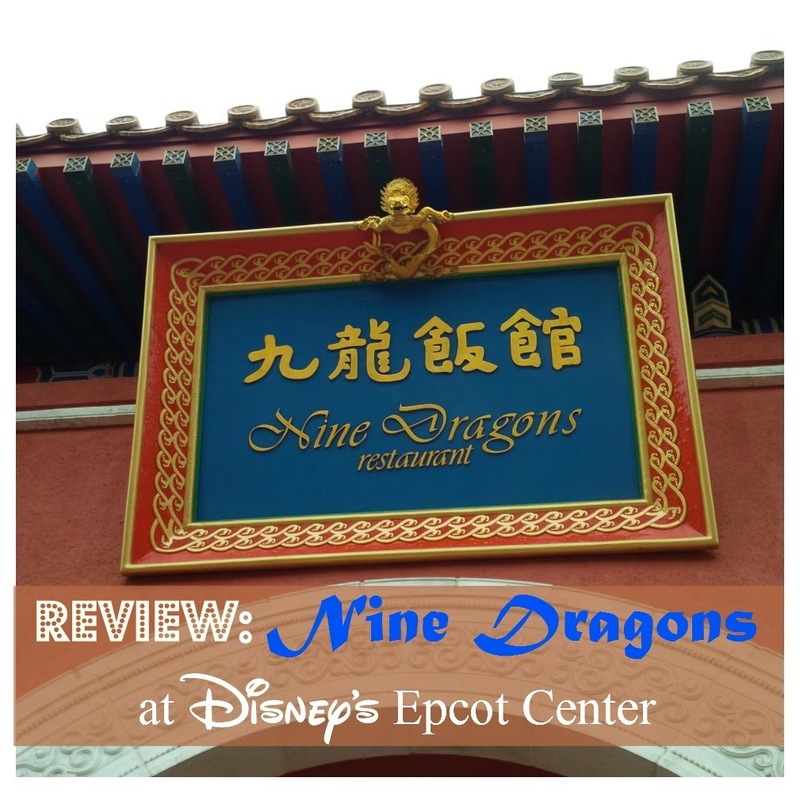 So overall, I did enjoy Nine Dragons and I would not hesitate to go there again. I know the portions look small in my pictures, but they could easily be split between two people with moderate appetites. I wanted to share this product today because I thought it might be a good product that some people might want to put on their holiday list. Anytime I find a new running product I am always excited to try it. There are many fuel belts out there, some great some not so much. The biggest problem that comes with fuel belts is finding the right one that doesn't bounce while your run. Another problem are the loops that you put your GUs through that you find may fall out during your run. Well problem solved. Meet the Roo Sport. 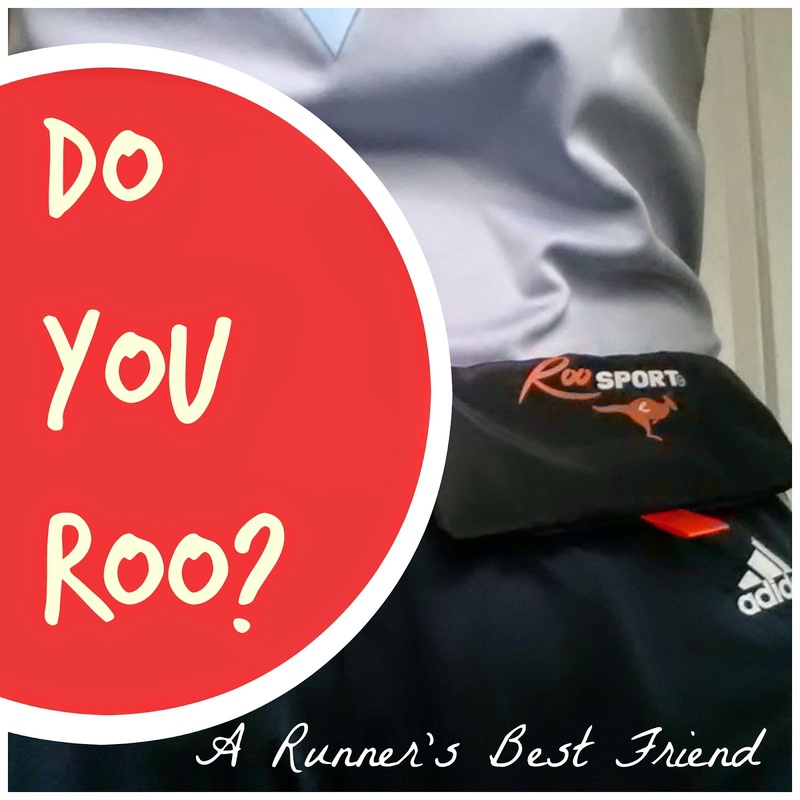 Roo Sport is a small pouch that has a magnetic strip that fits on your waistline. The above picture is just to show where it snaps at. (Of course I would not wear my shirt tucked in while I run). 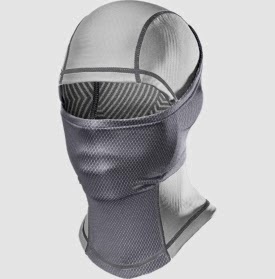 The pocket actually is open that faces towards you so it is easy access. There is an additional pocket that has a zipper on the other side. There are few different sizes to choose from. I chose the smallest one. One because I didn't need anything too big and two it was the least expensive. The description said it would fit several GUs, keys, and credit cards. I thought that's exactly what I need it for. Perfect! It did make it very clear that the small ones did not fit smart phones. I don't normally carry my phone with me anyways and was not looking for something that did so I wasn't to worried about that. Well let me tell you, my phone DID fit (without the case). I have the Samsung Galaxy 3. I was quite surprised. I took a few trial runs with it on and I couldn't even tell I had anything on. I had several GUs and a few tissues in there. ( Even though my phone fit in it, I did not run with it). The real test was when I used it for the Vegas full Marathon. it was great! I had no problems with it bouncing or getting anything out of it I needed. In addition to wearing it for the race, I wore it during the day walking around. It was so nice to not have a purse to carry around. I did put my phone in it during this time, as well as credit cards, cash, and chapstick. I am looking forward to taking it with me to Disney World while visiting the parks. It will be great to go hands-free. If you want to try a Roo of your own, they are giving a 20 % discount. Use code roosale at checkout. If not what are you waiting for? Go try it! I was not asked to write this review. I truly love the product and just wanted to share. Good morning all! Well, it's still morning here in Vegas anyway! These past few days have been absolutely exhausting. 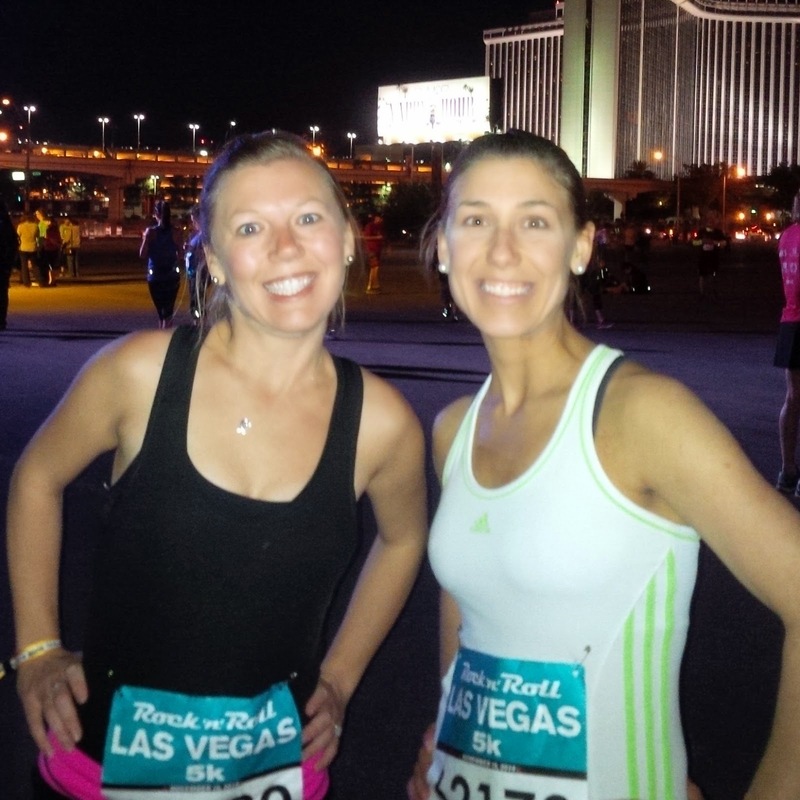 We had the very long plane ride, then the 5K, and then the Full and Half marathons last night. We will get a full review of the races later this week but last night's race was a bit chilly. There was even a freeze warning in effect. Can you believe that? Of all nights! Besides that, there was still some PR action going on! We aren't quite the party animal type so we didn't do a lot of celebrating afterwards. The cold weather and pure exhaustion we felt played a role in that. However, we will be going out some today and tonight. The weather is actually suppose to be warmer today. 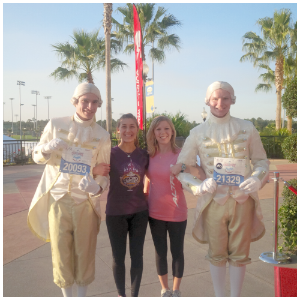 We also want to give a big congrats to our friends who ran in Richmond and in Disneyland this weekend. It was a great weekend for races! I have been wanting to re-decorate a few rooms in my house for quite a while now, but I keep putting it off and putting off because I believe painting a room is a huge undertaking. Scott on the other hand thinks it's no big deal. If you don't like the color, you can just paint over it. Well, as true as that may be, I know that's easier said then done. A lot of time and effort goes in to painting. It's not just painting, it's moving furniture, covering the carpet, taping up the trim, etc. That is why I study my paint samples days on end, in the dark, in the light, in the natural daylight, and up against the carpet before I decide which color to go with. I want to make sure it's a color I'm going to be happy living with for many years! So let me give you a little background, ten years ago when we purchased our home, it was a blank slate. White walls everywhere. Scott insisted we get some color on them. Of course I went through my routine of getting the paint samples and then taking forever to decide on a color. One evening we were at Home Depot to get some paint samples for the living room. I thought we were only getting samples but Scott insisted that we come home with a color that evening. I was going crazy, I couldn't decided on something right there on the spot. You mean I can't take it home and see it in the dark? I can't see how it looks in the daylight? I can't match it up against the carpet? So trying to be a smart alec, I pulled out just a random paint sample and said "okay, I'll go with this one". I really just wanted to see what Scott would say. Being as agreeable as he is, he said "okay, lets go get it mixed up". I was shocked. I said WAIT, Do you know what color this is? It's Pink. We can't have a pink living room. Actually the color was called "Suede by Eddie Bauer", And it was a deep shade of pink. Needless to say, that is the color we ended up with and it has been on our living room wall for 10 years now. I'm a little sick of the color, but alas I am too lazy to go through the effort to re-paint it. Actually I think the thing that is holding me back is that I haven't found the perfect drapes yet! 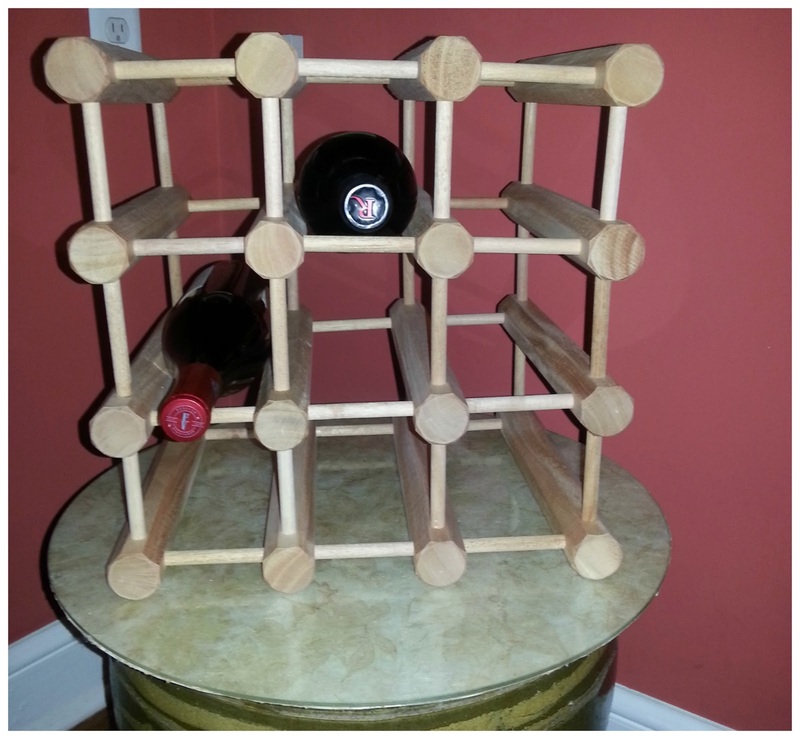 But in the meantime I am going to try to redecorate in other ways to bring in some different colors. 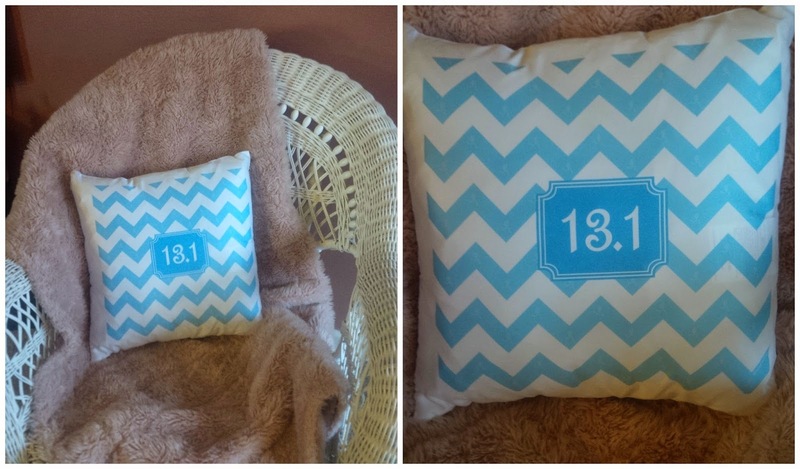 I wanted to add shades of blue to this room and this pillow that I received from Gone For A Run is helping me do that. This is just the incentive I needed to start displaying more colorful decorations. I haven't bought any throw pillows in quite a while because I had a dog that would chew them a part. This particular dog no longer spends time in the living room anymore, so I am happy to display this pillow there! I was surprised to see that the pillow had a smooth satin-y type finish on it and the casing is removable and washable. If you look really closely, inside the chevron print is a stick figure runner girl. It's hard to see and I didn't notice it either at first. The pillow insert is actually a faux down and it very soft. I really liked the Chevron print and wanted it in blue ( because like I said, I want to start adding more color to my room), but there are lots of fun styles and prints to choose from. The above dog pillow was also a contender. You can of course get your name or a race bib printed on it as well. 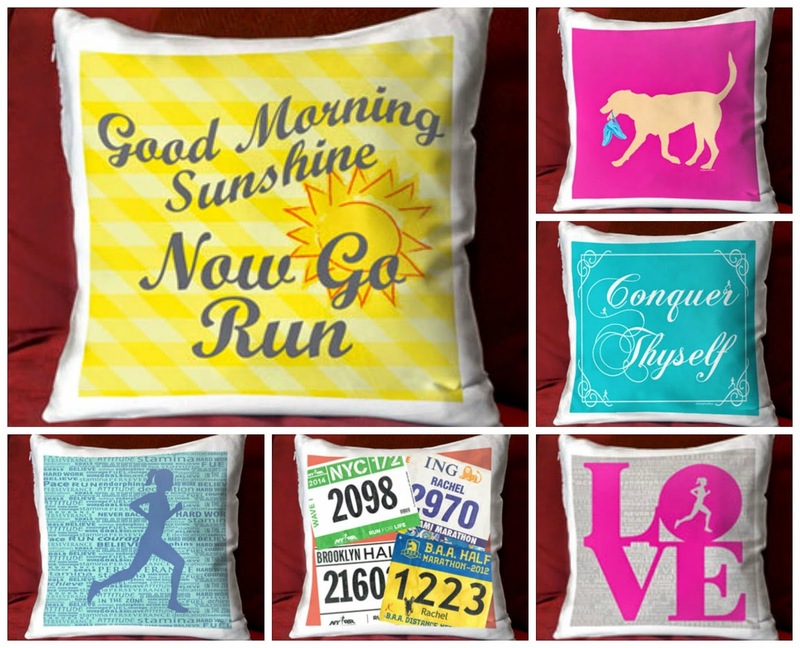 Gone For A Run has over 50 styles of pillows and each one of them comes in multiple colors. 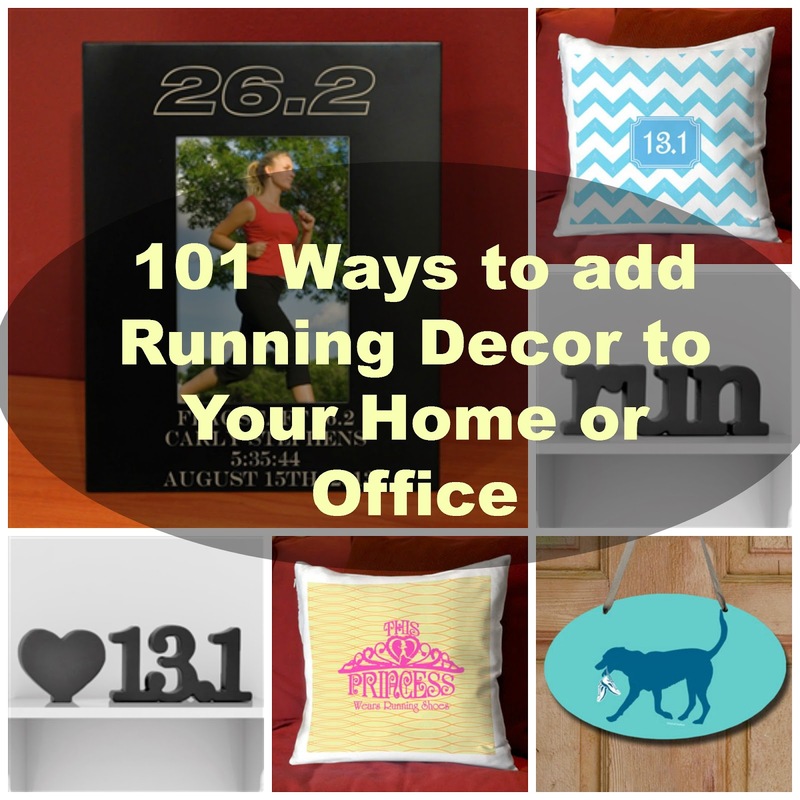 Do you have any "Runner" decorations in your home? 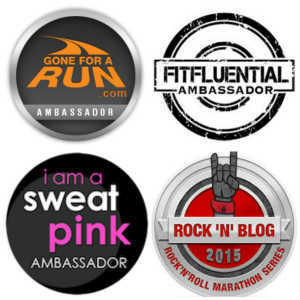 I am a Gone For a Run ambassador and was provided the 13.1 pillow free of charge. As always, all opinions are my own. Since today is my birthday I thought I'd share with you some of the goodies I received this week. 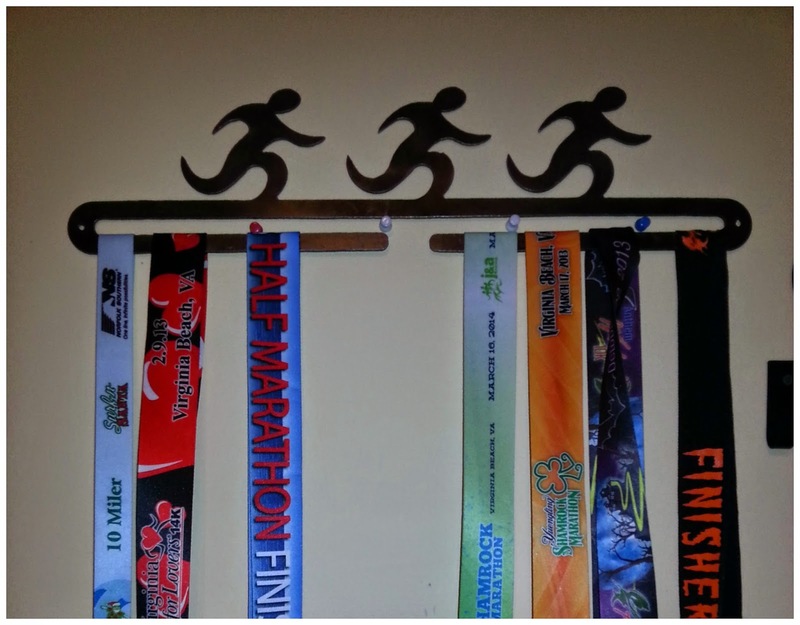 Medal Hanger- I was pretty excited about this one in particular because it is the J&A logo. If you live in the Virginia area and ever ran any of their races, then you will recognize this. I completed all the J&A races in 2013. In additional to one in 2012 and one in 2014. Now I have a place to display them all. 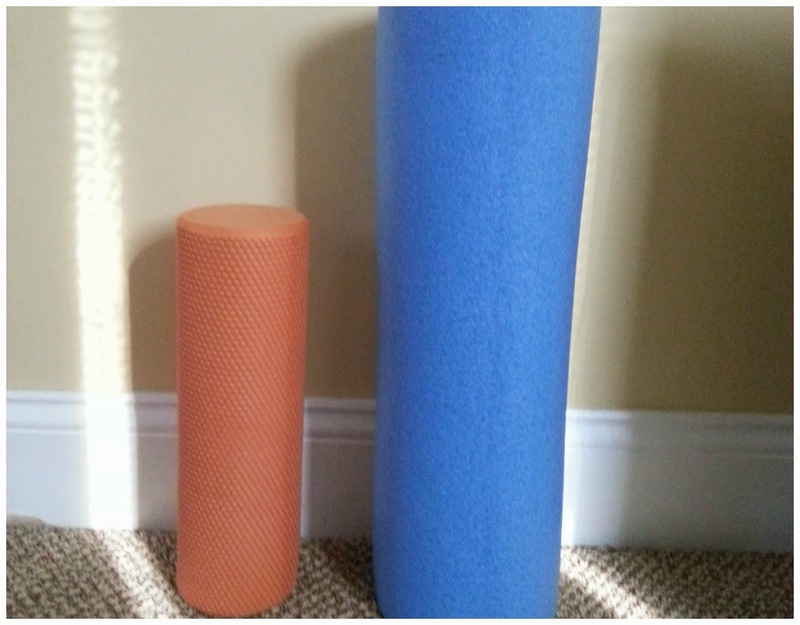 Also I got a mini foam roller to take when I travel to races. This will come in handy this weekend for Vegas. I got this piece of Bling in the mail this week. 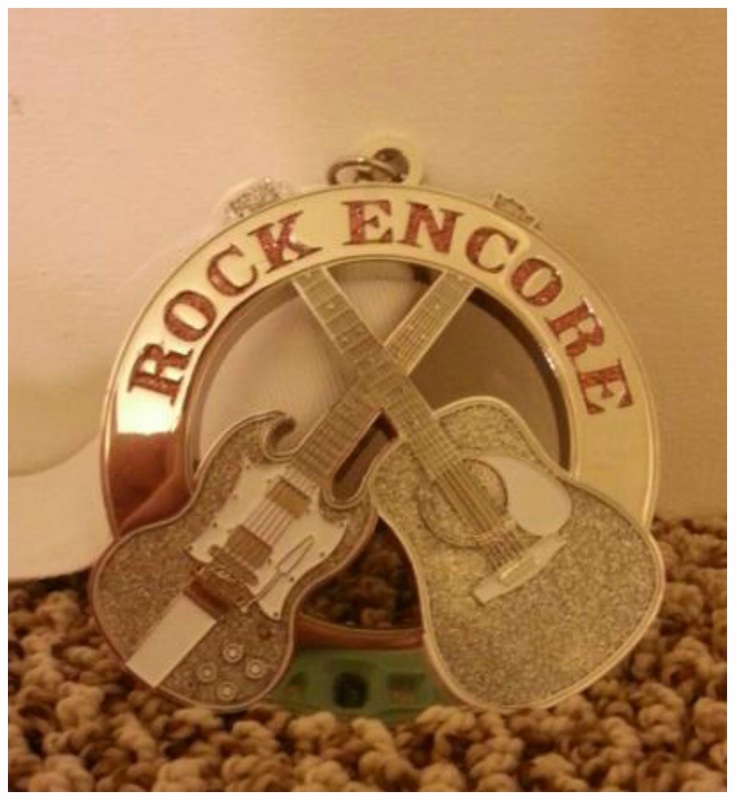 It's for completing 2 Rock n Roll series races. I'm looking forward to getting my third one after Vegas. I was sent a box of Protein Chox to try. I worked some long hours this week and thought it was the perfect time to try them since they have 22 grams of protein. After eating one of these bars I can honestly say they were quite filling and it held me off until my next meal, unlike many protein bars I have tried in the past. A few things I enjoyed about these bars is they don't have hardly any dietary fiber in them. Now you may think that is a bad thing, but when you are working long hours and always on the go you don't have time for additional bathroom breaks. And with that much protein in them, they are filling enough. Speaking about protein. It did not taste like most protein bars that you may have tried. I hate when you can actually taste the whey protein in it and the thick consistency it may come with. This almost takes like it could pass as a candy bar. The flavor I tried was maple and pecan, which was delicious. But they also have many other tasty flavors to try. I was given a complementary box of Protein Chox to enjoy. And although not running related, I came home from work and this was set up in the dining room. 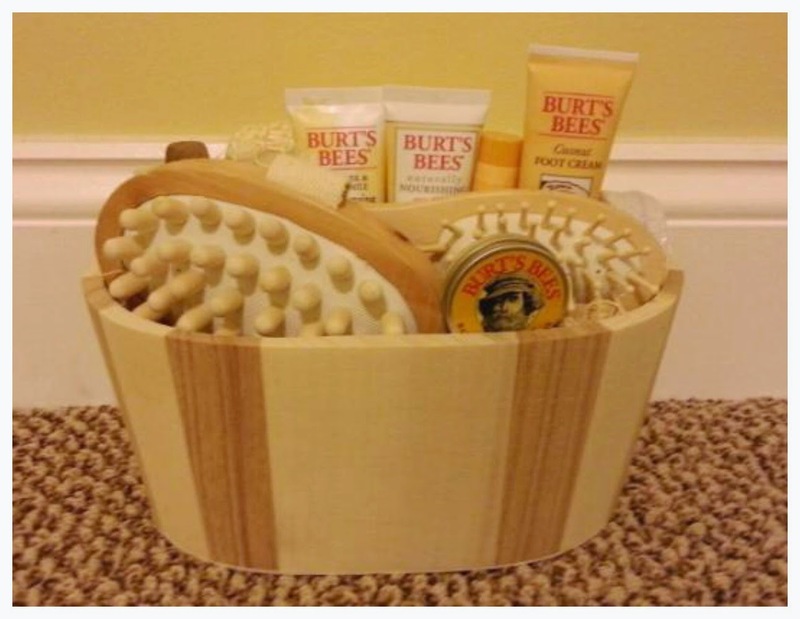 And this Burt's Bees Gift Basket was delivered to me. 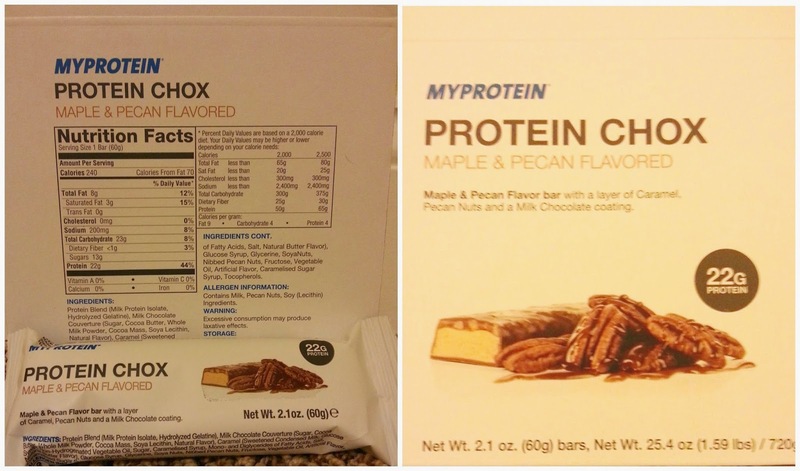 Have you tried Protein Chox? 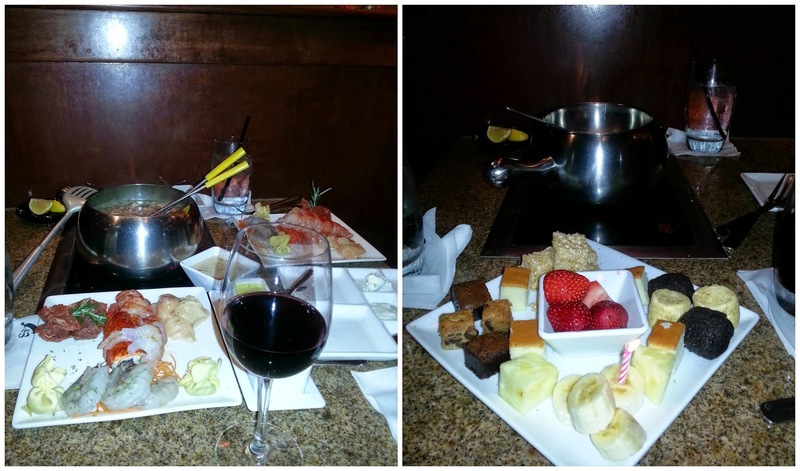 Do you like the Melting Pot? 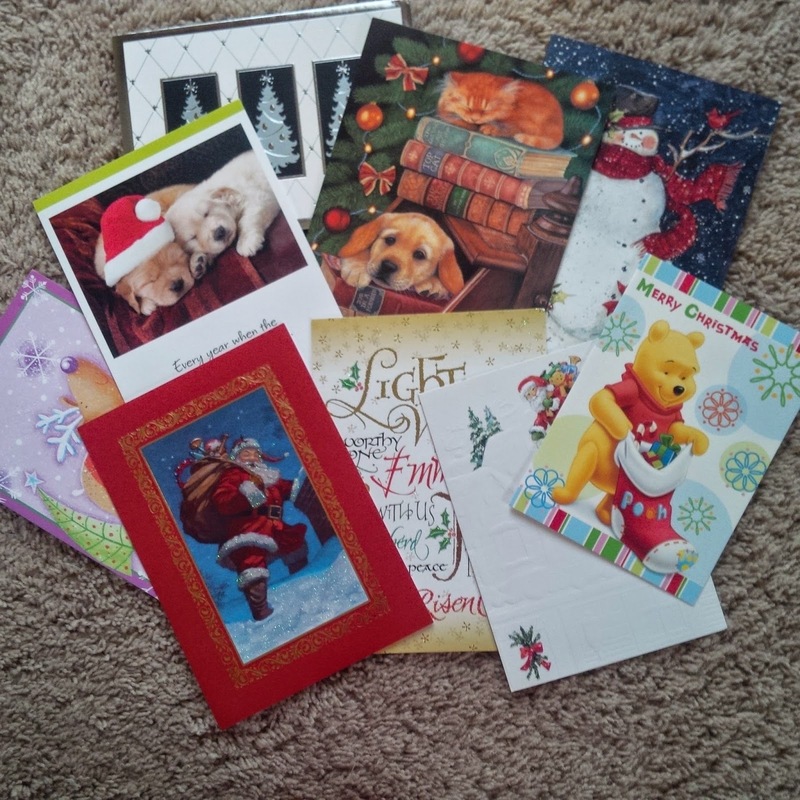 Don't forget to Enter our GIVEAWAY and sign up for the Holiday Card Swap. I have done many post race massages, the ones that are offered directly after the race but I have had very few "professional" massages. Don't get me wrong, I am sure the people giving the massages in the race tents are professionals, but I'm talking about a massage at a spa or studio. My first "real" massage was at the Phonecian Resort and Spa in Arizona and that was several years ago. A few months ago I had my second "real" massage at a studio near my home and it was fabulous. Do you remember me commenting back then about the massage therapist being blind? Well that was not a concern at all. In fact I booked a second appointment with her and it was equally as fantastic. In fact, we talked about some things people can do to make sure they (and their massage therapist) have a pleasant experience. 1. Get there early: If you are a first timer, you will need to show up early to fill out paperwork and what not. 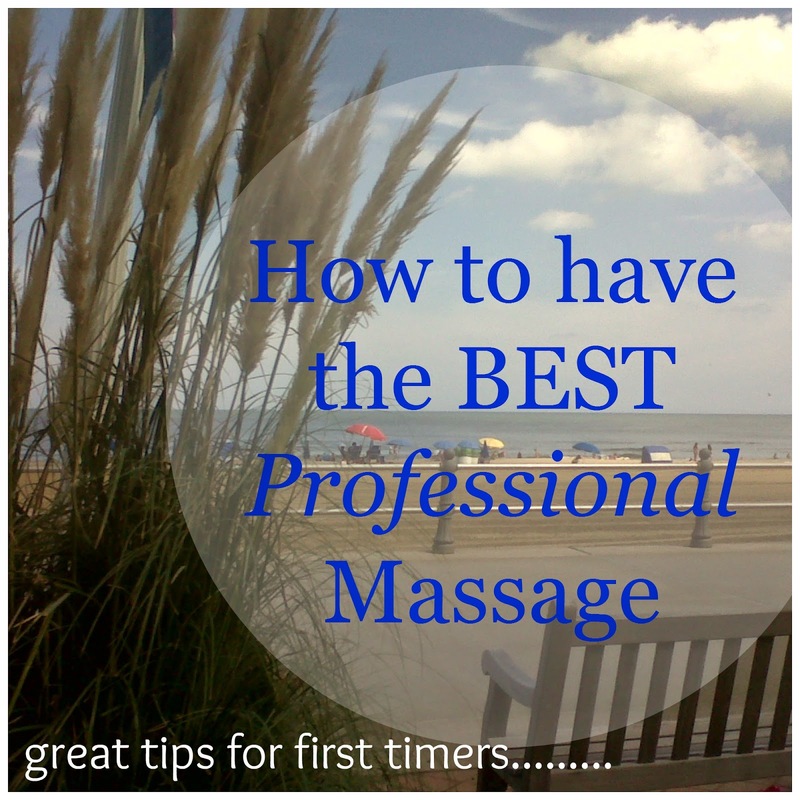 If you have been there before, know that generally your time starts from when your appointment is scheduled, NOT from when your massage starts. For instance, if your appointment is at 9:00 am and you show up at 9:10, you've already loss 10 minutes of massage time. 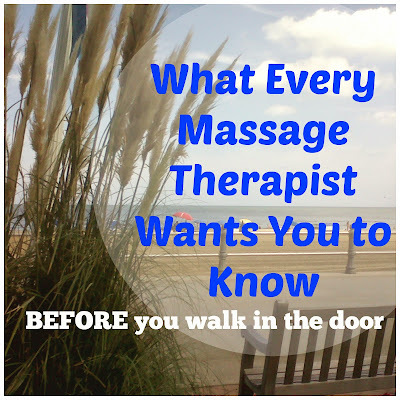 Of course each massage therapist is different and if nobody is scheduled after you, he or she might give you a break. But to play it safe, show up early. 2. Be clean and showered: you would think this is a given but my massage therapist said that you wouldn't believe how many people come right to the studio after working out at the gym. 3. Don't wear a bunch of Jewelry, tie long hair back and watch how you dress: This is also common sense. You'll end up taking that jewelry off anyway. I would also add to not dress too complicated. You don't want to waste too much time fiddling with ties and buckles and buttons and what not. You will be taking your clothes off ( with the exception of your underpants). Don't worry, you will be covered with a sheet the entire time. 4. Hydrate: Not only should you be hydrating well before the massage, but hydrating well AFTER the massage is essential. My massage therapist gave a very good analogy when she said our bodies are like a wet dish cloth. When you wring out the cloth you are releasing all the water. The same thing happens with our body. 5. Communicate with your therapist: Sounds easy enough but not a lot of people do this. Tell the massage therapist what you want. If you have problem areas, tell them. If the pressure is to intense, tell them. If the pressure is not enough, tell them. Don't be afraid that you will offend them. They want to give you the experience you want but they are not mind readers! 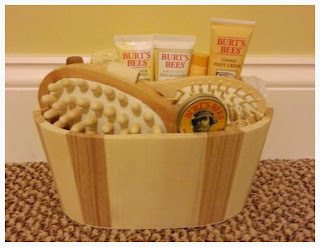 * If you are a Runner it is not recommended that you get a deep tissue massage the day before a race. Your massage should be at least 2 or more days away from race day. Remember this tip when you go on a "Racecation" because you may be tempted to check out the spa at the resort and get that much needed massage before race day. Lighter massages should be okay. Where is your favorite place to get a massage? 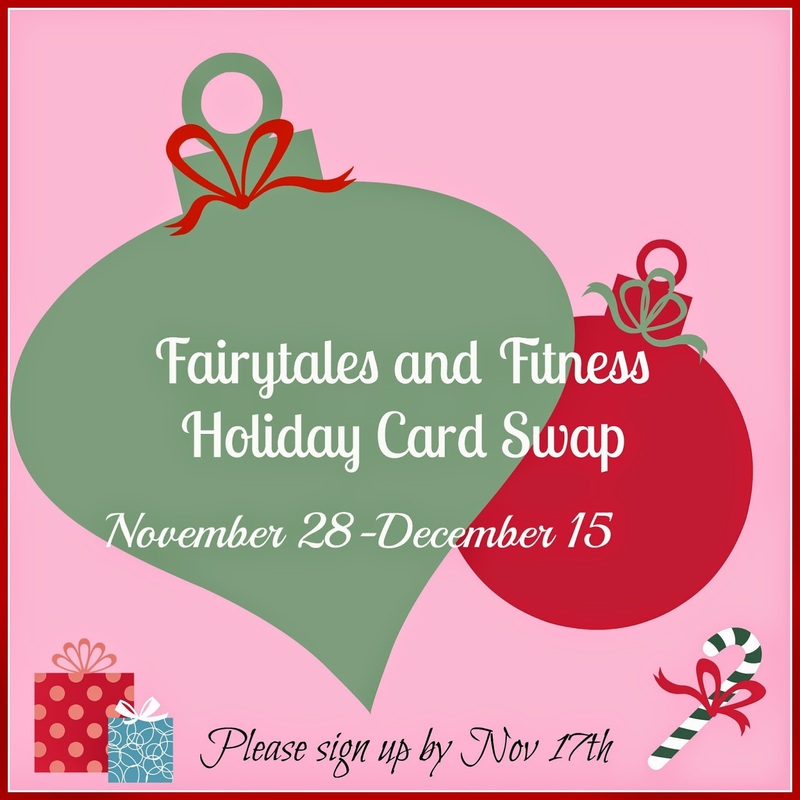 Don't forget to enter our GIVEAWAY and have you signed up for the HOLIDAY CARD SWAP? If you are reading this post, then that means you are a blogging friend of ours. We'd love for you to increase your circle of blogging friends this Holiday season and that is why we are hosting a Holiday Card Swap. We would love for ALL of you to join in. Here's how it will work. Each blogger who participates will get the name and address of another blogger. You would then send that blogger a holiday card. You are encouraged ( but not required) to send "a little something" with your card. It might be just some words of encouragement, maybe a coupon for an item you think they would like, it could be anything really, but please make sure it fits inside the card. We don't want you to have to use anymore then one stamp to send it! Once you get the name of your "secret blogger" you are encourage to visit their blog ( if you aren't already reading it of course). You might find that they are training for an upcoming race or maybe they are having a tough time with something and your encouraging words will be just what they need this holiday season. It is up to you as to whether or not you want to keep your "Secret blogger" a secret. Know that you will actually be connecting with 2 blogger, One that you will send a card to and one that will be sending you a card. We thought this would be the best way to increase engagement among all who want to participate. Also, we don't have to worry about having an even number of participants. Okay, so now you want to participate, right. So now what? 1. Let us know that you want to participate by Nov 17. PM us on Facebook, or email us. ( Our email can be found on the about us page). You'll need to supply us with the name of your blog ( which I am sure we already know) and your mailing address. Please know that your mailing address will only be share with us ( Meranda and Lacey) and whoever is chosen to be your "Secret blogger". Sometime after Nov 18, you will get an email stating who your "Secret Blogger" is. 2. Follow us on Facebook. You'll want to make sure you are joining in our discussions this holiday season. Also this will be an easy way for us to communicate with you. 3. Mail out your Card. Holiday cards should be mailed out between Nov 28 and Dec 15. This way we get it all in before the Holiday rush of that last week before Christmas. And remember, once you get your card, mention it and the sender in a blog post! While I was on the phone with a good friend Thursday night, we were talking about each of our illnesses. (I think it's a sign of getting older when you have in depth conversations about mucus and phlegm) But anyway, she was telling me a tip she learned from her friend about using vinegar an water to clear your throat of phlegm. At this point I was willing to try anything, so I did. In case you find yourself in my situation later this season, here is what I did. 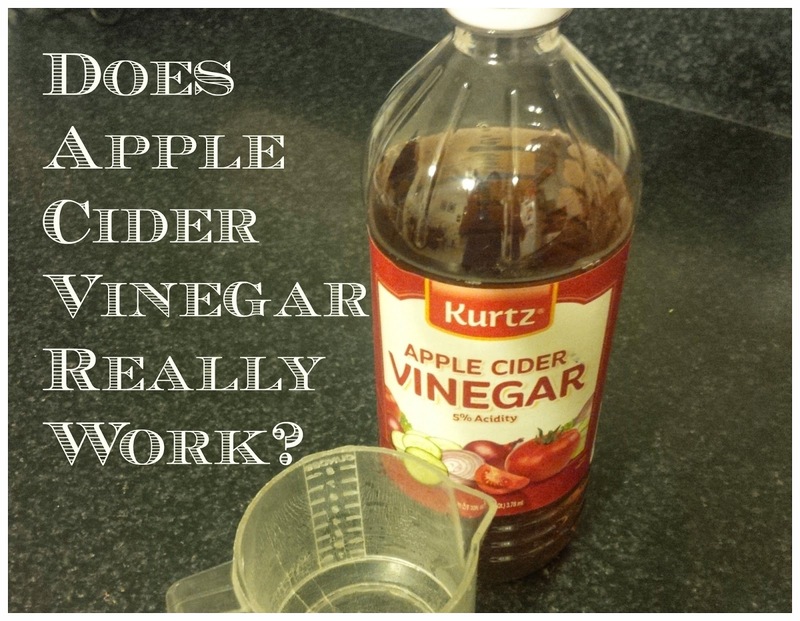 Mix 2/3 cup cold water with 1/3 cup Apple Cider Vinegar. Gargle, and then ( with the mixture still in your mouth) hang your head upside down ( like you are going to touch your toes). Every 2 -3 seconds tap the rough of your mouth with your tongue ( I think this controls where the liquid goes in your mouth). You are suppose to stay in this position for 3 minutes. I couldn't only stand to do it for only 1 minute ( because I couldn't breath out of my nose because it was all stuffed up and I obviously could not open my mouth). Do you have any remedies to help clear your throat of phlegm?